Near and above treeline on NW-N-NE-E aspects steeper than 35 degrees the avalanche danger is HIGH due to intense snowfall, gale force winds, and persistent weak layers in the snowpack. Below treeline the danger on these aspects is CONSIDERABLE. Large human triggered and natural avalanche are likely today. Travel in or below avalanche terrain is not recommended. After a brief lull yesterday, the second storm in this series arrived over the forecast area last evening. This storm has brought hurricane force southwest winds with gusts as high as 121 mph recorded along the Sierra Crest and heavy precipitation. These winds should remain strong through the weekend. 1-2.5 inches of liquid has fallen from the skies since yesterday afternoon. Snow levels have stayed between 7000 and 7800 ft since then as well creating very dense snow where there is new snow. So far 6-13 inches of 20% density snow has fallen above 7500 ft. Snow levels should decrease some today and fluctuate between 7000 ft and 7500 ft as the intense precipitation continues. The forecast calls for another 1-2 ft of snow above 8000 ft today and a mix of rain and snow below. By tonight the precipitation should slow down as this storm moves out of the area. The last storm in this series should begin to impact the area tomorrow and precipitation rates should increase again. This last storm which should continue through Sunday should bring the most precipitation, the warmest temperatures (snow levels above 8500 ft and possibly as high as 10,000 ft), and the most precipitation. 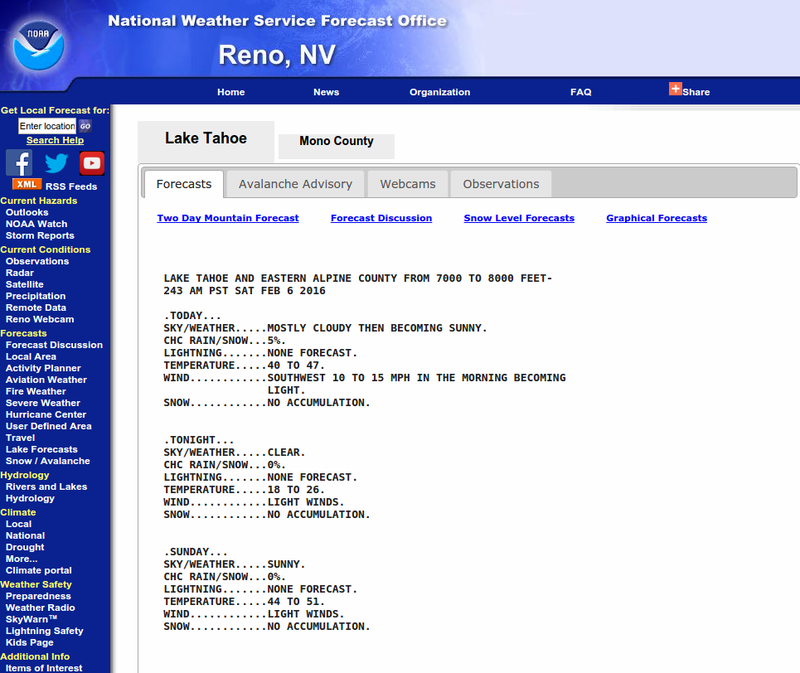 For more information check out this weather briefing from the Reno NWS. Yesterday observations on Mt. Judah (near Donner Summit) and on Meiss Ridge (near Carson Pass) both showed lingering instability. On Mt Judah snowpit tests indicated that weak layers created during the storm could still break and that once these layers broke fractures could travel along them. Along Miess Ridge tests showed similar unstable results on a layer of weak sugary snow below a crust below the new snow (videos more info). In both areas these instabilities remained relatively shallow (less than 1 ft deep). Some skier triggered shooting cracks up to 4 ft long also occurred in wind loaded areas on Mt. Judah. On Meiss Ridge one of the new formed cornices collapsed onto the slope below and triggered a small slab fracture within the new snow (photo). Natural and human triggered avalanches involving newly formed wind slabs will be likely today. The strong winds and heavy snow will have caused the wind slabs that started forming on Wednesday to become larger and more widespread. These winds slabs could easily grow to over 4 ft in depth in many places today. Today's strong winds will continue to move snow and cause wind loading to form wind slabs in unexpected places. These wind slabs sit on top of ice crusts, other wind slabs, and even some persistent weak layers. Any of these layers or interfaces as well as weakness that form in the new snow could serve as a failure layer. The largest and most fragile wind slabs will exist on near and above treeline NW-N-NE-E aspects where the most wind loading has and continues to occur. Some smaller but still fragile wind slabs may exist in more protected areas due to the strength of the winds. Changes in snowfall intensity, snow levels, wind speeds, and other small changes in the storm characteristics will create different layers within the storm snow. Some of these layers could easily serve as weak layers. With 1-2 ft of snow expected above 7500 ft today soft storm snow slabs could form on top of these storm snow weaknesses in any areas where significant snow accumulates. Human triggering of these types of avalanches will be likely today on steep slopes where these soft slabs exist. This problem results from the existence the persistent weak layers in isolated areas above 9,000' on NW-N-NE aspects both along the Sierra Crest and in the Mt. Rose area. Data indicates that as the load on top of these layers increases, these kind of avalanches should become easier to trigger. This problem will combine with the two other avalanche concerns mentioned above and could allow larger, deeper, longer running avalanches to occur today. The deeper snowpack will make this layer more difficult to detect today. 0600 temperature: 27-33 deg. F.
Max. temperature in the last 24 hours: 32-35 deg. F.
Weather: Rain and snow with snow levels fluctuating between 7000 and 7500 ft. Rain and snow showers snow levels fluctuating between 7000 and 7500 ft. Rain and snow with snow levels fluctuating between 7500 and 8000 ft. Temperatures: 33-40 deg. F. 25-35 deg. F. 33-40 deg. F.
Wind speed: 45-60 mph with gusts to 100 mph decreasing to 40-55 mph with gusts to 90 mph in the afternoon 45-60 mph with gusts to 95 mph 50-65 mph with gusts to 100 mph decreasing to gusts to 90 mph in the afternoon. Expected snowfall: 8-16 in. up to 4 in. above 7500 ft: 4-8 in. Temperatures: 28-35 deg. F. 22-29 deg. F. 29-36 deg. F.
Expected snowfall: 12-24 in. up to 4 in. 6-8 in.